While gold is the king monetary metal, silver will turn out to be the king precious metal performer. Currently, gold is stealing the show as the East (China) continues to consume more than total world gold production. However, silver will surprise the markets in the future as overwhelming demand will outstrip supply in a big way. The key factor that will drive up the price (value) of silver much higher than gold in percentage terms, will be its affordability. As the price of gold heads back above $1,500 and silver to $30, an individual can buy a heck of a lot more silver than gold. As the public and market are lulled back to sleep (presently) on the value of silver, there will come a time in the future when it will be impossible to acquire a single ounce… only at much higher prices. Silver Will Be The King Precious Metal Performer. 2014 Silver Eagles As Low As $2.69 Over Spot! Mike Maloney discusses this in a recent video, Silver Has More Potential Than Gold. “All the Central Banks and economists said that gold was going to fall because there was not going to be demand for it as money. Instead of falling, gold started rise and anyone who said that if was going to $100 was considered a lunatic. It went to $850 (by 1980). Mike went on to say that during the 1970 decade, gold increased 24 times its value, whereas silver’s jump was 36 times. Here we can see that total supply outstrips demand by 178 million oz. In 2012, the difference between supply and demand was 201 million oz, but 41.5 million oz of that amount went into “Producer De-Hedging.” All de-hedging means, is a cut from the silver producers hedge book. GFMS estimates 2013 total silver supply (1,055 mil oz) to rise 7 million oz more than in 2012 (1,048 mil oz). However, total estimated fabrication demand will increase 30 million oz to 877 million oz from 847 million oz in 2012. Regardless, the 178 million oz surplus does not include any silver investment demand from standard bars and bullion coins that are not in the “Official coin” category — Eagles, Maples, Philharmonics, Pandas and etc. 1 oz Silver Buffalo Rounds As Low As 79 Cents Over Spot at SDBullion! The $14 billion figure on the left side of the chart represents the current value of all the Global Silver ETFs. If we add the $4 billion of supposed silver surplus in 2013, it would increase the total to $18 billion — a paltry insignificant figure in the whole scheme of things. The chart above shows where the U.S. public holds its cash. Unfortunately, Americans have been conditioned to believe that fiat money is a store of value. Fiat money is not a store of value, but rather just a paper currency used for trade. We are witnessing the devaluation of many fiat currencies throughout the world presently. It is just a matter of time before the U.S. Dollar loses its role as the world’s reserve currency and experiences a 30%+ decline in value. As I have stated over and over again… technical analysis is worthless in a rigged market. Furthermore, I want to add another qualifier… technical analysis will become increasing worthless in a peak energy environment. I believe ENERGY IS THE KEY to understanding where the value of precious metals are heading as well as the overall economy. Many precious metal analysts are constantly talking about the GREAT MONETARY RESET that’s coming (I agree)… but what happens after that? Does anyone pay any attention to that train of thought? What happens once we see say $5,000 gold and $200 silver? What do you do with you precious metals then? It all gets back to energy. Let’s look at what is taking place in the natural gas market. The price of natural gas shot up to $6.50 briefly before getting knocked down to $4.60 currently. Shale gas production doesn’t make a major upward move until 2016, according to EIA.Spot prices for natural gas at the major Louisiana pricing hub will drop to $3.12 per million British thermal units in 2014 and 2015, below this year’s average forecast price of $3.25, according to EIA’s Annual Energy Outlook. Prices don’t pick up until 2016 either, in the EIA assessment. Actually, the EIA (U.S. Energy Information Agency) was forecasting an even lower price than $3.50 for 2014 and 2015. Furthermore, Charles Nenner who worked at Goldman Sachs and now has his own forecasting service, made an even worse prediction. You may have heard Charles Nenner or his associate, David Gurwitz being interviewed on GoldSeek and Financial Sense recently. David Gurwitz spoke with Jim Puplava on Financial Sense on Oct, 13th, 2013 about Nenner’s forecasts for gold, silver and various commodities. I paraphrased what he said just a bit, but that was the basic forecast for natural gas coming from Nenner Research. If we look at the natural gas chart above, the price did not continue to fall towards $2.50, but instead spiked higher to $6.50. Nenner and Gurwitz do not follow supply and demand fundamentals, rather they look at math and cycles. While I have a great deal of respect for analysts who are able to see price trends through cycles, I believe this sort of analysis becomes increasingly worthless in a peak energy environment. The reason the price of natural gas spiked over the past several months had EVERYTHING to do with supply and demand forces. The table below details U.S. natural gas withdrawals and underground storage levels. Year of the Horse Bars & Rounds As Low As 89 Cents Over Spot at SDBullion! Total natural gas withdrawals for the most recent report were 95 Bcf, which pushed the underground gas storage level down to 1,348 Bcf.. 40% lower than the same period last year. 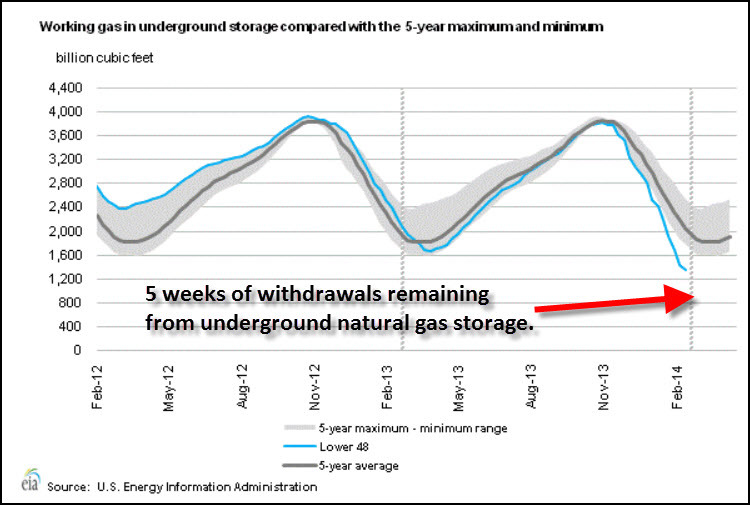 There are still five weeks (on average) of net gas withdrawals remaining. The extreme cold winter in the Midwest and Northeast had a lot to do with the huge draw-down of underground gas supplies as well as the recent price spikes. However, this isn’t something Nenner and technical traders go by when they make their future price forecasts. What happens if the U.S. does peak in natural gas production in 2014 or 2015? I am not saying it will (chances are becoming more likely), but this is not taken into consideration by the technical Chartists. Keep an eye on the price of natural gas in March. If we continue to see large weekly withdrawals of underground gas supplies, the price will head back over $5. So much for technical analysis and prices below $2.50. I presented the 2013 silver supply and demand balance figures to show just how little there was in a “Dollar Surplus.” When the Fed purchased over $1 trillion in U.S. Treasuries and MBS – Mortgaged Backed Securities in 2013, the hidden value of silver increased substantially… even though the paper price did not reflect it. The price or value of silver will move up much higher in percentage terms compared to gold in the future due to its affordability to the masses. Technical analysis will be worthless in forecasting this meteoric rise –just as Charles Nenner’s technical analysis failed to see the rise in the price of natural gas in 2014. Precious metal investor need to stop paying attention to these orthodox silver supply and demand forecasts as they will become irrelevant in the future as global peak oil production destroys the biggest Fiat Monetary Ponzi Scheme in history. The 1 oz Silver Incuse Indian is Available Now at SDBullion!